Buying a diamond is a major investment that can cost thousands of dollars. When you spend that kind of money, you want to be certain that you are doing business with a wedding ring shop that you can trust. The diamond grading industry is subject to very few regulations, and this can mean big differences in appraisals from one laboratory to another. Diamonds are graded according to a set of guidelines developed by the Gemological Institute of America (GIA), a non-profit organization that appraises and certifies diamonds and other gemstones. GIA reports are trustworthy; however, there are many for-profit laboratories in the industry that are routinely used to generate certificates that give diamonds higher marks than they deserve. Unscrupulous businesses then use these reports to appraise stones at much more than they are actually worth. It pays to choose your wedding ring shop wisely. The GIA guidelines for assessing diamond quality are cut, color, clarity and carat. Cut describes the shape of the diamond and the resulting sparkle or brilliance of the stone. Grades of cut range from excellent to poor. The diamond color scale goes from a score of D, which means nearly colorless, to Z, which means the stone has a definite brown or yellow cast. Clarity is graded in terms of inclusions, which can be gas bubbles, foreign matter or internal cracks, as well as external flaws, such as chips, cracks and scratches. The clarity scale goes from flawless to included when viewed under magnification. 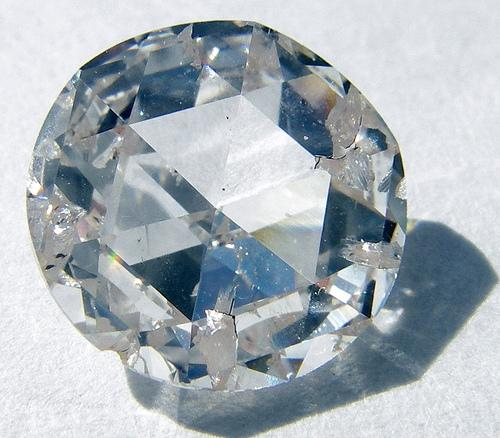 Carat is the stone’s weight, and one carat is equal to 200 milligrams. When these scales are used appropriately, they provide an objective and trustworthy description of a stone, but some businesses are easier graders than others. An ABC News affiliate in Denver recently examined two reports from different labs on the same one carat diamond and found a vast difference in values: $3,200 from one lab and $6,000 from the other. Unlike some other wedding ring shops, Juno Jewelry provides a certificate of authenticity with every diamond we sell. This document certifies the cut, color, clarity, carat and the number of diamonds included in the piece, as well as the type of precious metal used. If you want an independent, third-party appraisal, that is available for a small additional fee. For over 30 years, Juno Jewelry has been manufacturing our own pieces using the highest quality materials available. Buying stones and precious metals directly from producers allows us to keep prices as low as possible, while continuing to produce fine pieces of diamond jewelry. Another issue with some wedding ring shops is where they get their diamonds. Juno Jewelry assures customers that all of the stones we sell are conflict-free. We do not use “blood” diamonds: stones that have been mined under harsh, slave-like conditions. We are opposed to those practices as much as our customers are. Be sure that the ring you are purchasing is worth what you are paying. Come to Juno Jewelry for a deal you can trust.